To be held March 15-16, 2019 in Las Vegas, the summit will explore sports globalization at the collegiate level, both within and outside of the U.S. 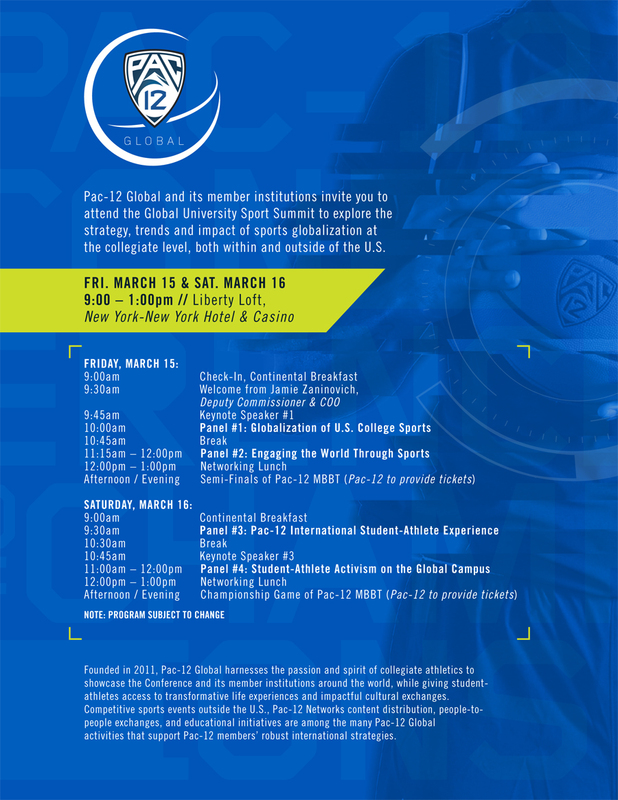 Please join the University of Oregon (UO) at an upcoming Global Sport Summit organized by Pac-12 Global and the four key institutions in our athletic conference (UO, University of Arizona, Arizona State University, University of Utah). Explore ideas at the intersection of U.S. college sport and globalization in three moderated panel sessions, hear from distinguished keynote speakers and engage with senior international officers, athletic directors and private sector leaders sharing perspectives and seeking new opportunities. The summit takes place in Las Vegas, Nevada, during the Pac-12 Men’s Basketball tournament, March 15-16, 2019. Special hotel pricing available. To confirm participation, contact Michelle Zhang: mzhang@pac-12.org.